Backing up SAP software environments is increasingly challenging in today’s 24x7 enterprises. Even more challenging is restoring these environments. Applications and databases grow ever larger, putting increasing strain on the management infrastructure. Using hardware-assisted copy mechanisms to perform fast backups and restores is one way to address these issues. Tivoli Storage Manager, along with associated products, allows you to leverage FlashCopy to perform fast backups, almost “instant” restores, as well as database cloning for testing and other purposes. These applications are fully integrated with SAP software in DB2 UDB and Oracle environments, providing reliable, intelligent techniques for data protection. 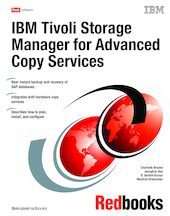 This IBM Redbooks publication will help you plan, configure, and run IBM Tivoli Storage Manager for Advanced Copy Services and associated applications in your SAP software environments.